Many women are aware that there is a host of symptoms that can occur during times of hormonal imbalance, such as menopause or the postpartum period. However, most are taken by surprise when they begin suffering from allergies they have never had before, or preexisting ones begin to become more bothersome. Allergies to pets and pollen are two of the most common allergy developments during menopause. However, there are things you can do to remedy these allergies naturally. Olive oil can help to remedy allergies naturally for a number of reasons. Firstly, it has a soothing effect upon skin that gets irritated due to allergies. By rubbing your skin with olive oil, it will not only benefit from being moisturized, but it will also be eased of itchiness and inflammation. Olive oil can also help to clear up rashes caused by skin allergies. Onions are a natural way to fight against and remedy allergies because they contain a bioflavonoid called quercetin. This phytocompound can help minimize the watering or itchy eyes that are caused by dust allergies. Consuming two grams of onions each day will help you to relieve allergies in a natural way. Increasing how much onion you have in your diet will also have a positive impact upon your overall health, because they can help fight against asthma, bronchitis, sinusitis, colds, and the flu. Ensuring that you keep your house properly ventilated is one of the key ways to prevent pet allergies during menopause. Keep your windows open as much as possible. This allows the air to circulate and will help to stop pet hair and skin particles settling into furniture and carpets, which exacerbates symptoms of allergies. Petroleum jelly can act as a safeguard for your nose. Placing petroleum jelly at the base of your nostrils can stop pollen particles and other allergens before you are able to breathe them in. This is a particularly good idea if it is necessary for you to be outside when the pollen count is high. Histamine is produced when the body suffers from an allergic reaction to dust. This histamine production is what leads to tearing eyes, excess mucus, and a runny nose. Vitamin C can prevent histamine from forming. The best sources of vitamin C are citrus fruits, bell peppers, and dark green leafy vegetables. Developing allergies during menopause is a hassle that most women can do without, as other symptoms often appear during this time too. Fortunately, though, these allergies can be remedied in a natural manner. 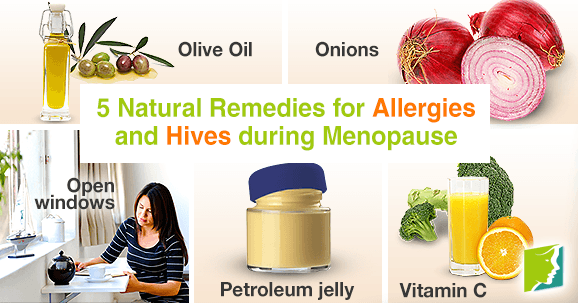 By implementing the above remedies into your life, you can get in control of your menopausal allergies.